Orange trees are well adapted to container growth as ornamental plants. They are prized for their fragrant flowers, healthy fruit, and their deep green glossy leaves. There is a long history of ornamental orange tree gardens that are known as orangery. Ornamental orange trees can be easily grown in containers on patios, walkways, or in formal garden settings by understanding their needs and growth patterns. Oranges were cultivated in 2400 B.C. in China. They spread to other parts of Asia, Africa and Europe by established trade routes. Ornamental orange trees are traditionally grown in a greenhouse-like structure called an orangery. This architectural style was popular in 17th to 19th century manor houses and it originated in the Renaissance gardens of Italy. The most famous orangery is at Versailles, where there were more than a thousand trees (mostly orange) growing in boxes. There is a restored orangery at the Hampton National Historic Site in Maryland. Container-grown ornamental orange trees are usually the dwarf varieties which grow to a height of 4 to 10 feet. Limited root space has the effect of stunting tree growth even if it is a standard variety. Citrus trees are damaged at frost temperature but can be grown in wintertime indoors. Varieties such as Dwarf Venous Orange and Hiryu (Flying Dragon) can easily be grown in box containers as an ornamental tree. Grow ornamental orange trees in containers which are at least 1 1/2 feet in diameter. Citrus trees grown as ornamental container plants need more attention to watering and pest control. Plant the tree using a high-humus-content soil to give very good drainage. Ornamental orange trees need moist but not standing water. If topsoil is dry to the touch, it needs water. Bring orange trees inside in the winter, placing them in a cool greenhouse or a basement with good light. Do not over-water under these conditions. Humid indoor conditions during winter may encourage insects. Watch for aphids, scale, spider mites and mealybugs. The North Dakota State University Extension Service recommends using insecticidal soap on these small insects. Fungus may develop if soil drainage is inadequate. Symptoms are yellowing leaves and leaf drop. 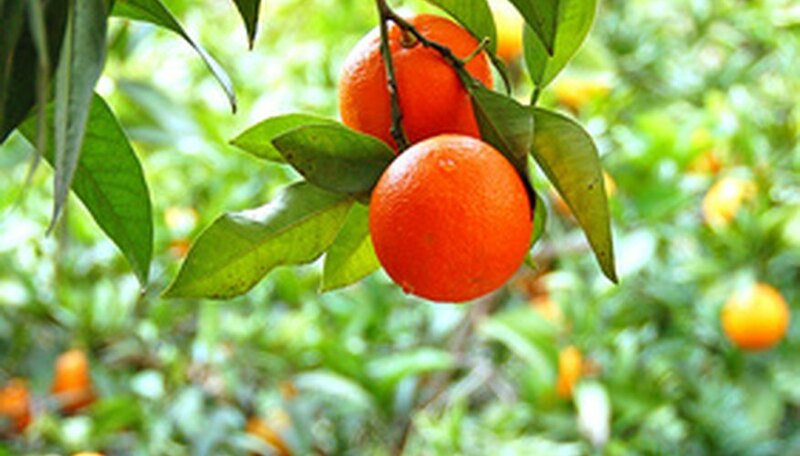 Orange trees are susceptible to sunburn in hot months. Protect the tree trunk with a paper wrap or whitewash paint. Citrus trees grown as ornamental container plants may take up to five years to produce fruit. Care and maintenance of the tree to keep it pest free will bring the rewards of fruit which ripens in the winter. They need pruning each year to maintain attractive shape. Cut all deadwood and crossing branches. Prune ornamental citrus to open the crown foliage to let in light and air.